There are good things to be said about growing up in a middle-class American family with all the white bread, WASP-y sterotypes that conjures up. Parents who stayed married till death did them part, family camping trips in the station wagon with my brothers fighting in the back seat, tuna casserole on Fridays (though it's my understanding that the Episcopal church left the fish-on-Friday tradition behind when Henry VIII divorced his first wife). 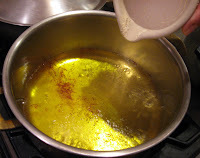 Adding the ground saffron salt to the boiling water. But it's hard sometimes not to envy people who had a more adventurous path. Like my friend Kathryn, the child of Southern parents and an Army brat who ate her first cornbread and beans in Japan. She eventually married and spent several years in Saudi Arabia where, interestingly enough, she learned to cook Indian food like a native. The holes, boss, the holes! 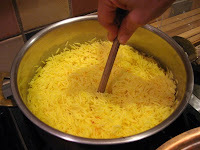 I've admired her saffron rice on several occasions with its perfectly cooked individual grains of golden rice. It's the idea match for all kinds of Indian dishes and is an aromatic accompaniment to anything braised. So when she offered to not only share her recipe but also show me how to make it, I was ecstatic. Rinse the rice in several changes of water until the water is no longer cloudy. In large bowl, cover rice with water and let it soak for one hour. Drain. 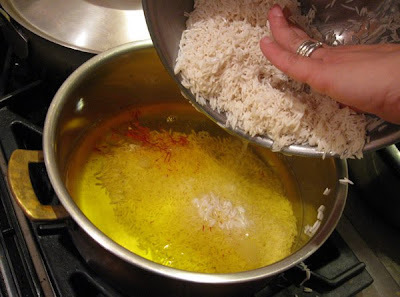 While rice soaks, in a small mortar and pestle combine salt and saffron, in Kathryn's words "letting the salt do the work for you" and grind it to a powder. Bring the water to a boil in a large, flat-bottomed pan. Add the saffron salt and return to a boil. Drain soaked rice and add it to the pan (top photo). 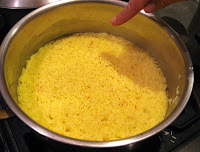 When it returns to a boil, reduce the heat to medium and watch for holes to appear in the rice. When there is no visible water on the surface of the rice, turn down heat to lowest setting and cook for 12 minutes. Turn off the heat, take off the burner and fluff the rice with a chopstick or fork (left). Cover pan with a soft cotton tea towel, place lid of top of towel and allow to rest for 5-15 min. Serve. * This recipe also works with jasmine rice. ** Great quality saffron is available for a very reasonable price at Rose International Market.